SECAUCUS, NJ — The official groundbreaking ceremony for the new Hudson County Schools of Technology High Tech High School took place today at Laurel Hill County Park in Secaucus. The ceremony included a large number of guests and elected officials, including Hudson County Executive Tom DeGise, who has made expanding the county’s educational systems a major focus of his tenure. 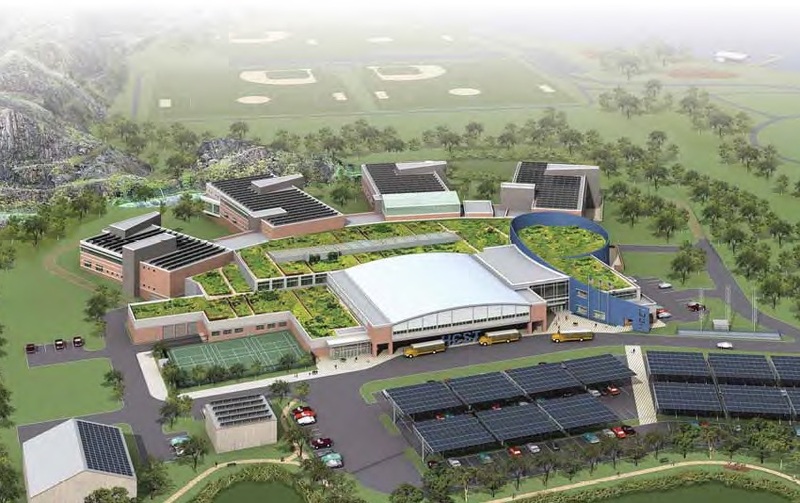 The new school will encompass 350,000 square feet upon completion and will sit on a 22-acre site on county property in Laurel Hill Park in Secaucus. It will be a state-of-the-art facility that is environmentally friendly, featuring a Leadership in Energy and Environmental Design (LEED) rating of Gold and potentially Platinum. It will also feature four self-containing wings and allow for academic concentrations in performing arts, culinary arts, environmental science, digital Fabrication Laboratory (dFAB), mechatronics, and more. The new school will serve 1,200 students which is almost 30% more than the current High Tech enrollment of 935. The school will cost approximately $160 million, with more than half of the funding coming from the New Jersey Department of Education. “This new school is the result of the county and state Department of Education working together to make this project a reality for our students,” said Assembly Speaker Vincent Prieto. The new school will replace the over 100-year-old building currently at 2000 85th Street in North Bergen, which has been used an educational institution since 1988. The proceeds from the sale of that property will help defray construction costs at the new school site.